Why Duplicates Expert's Scanning Result Cannot be Saved? Why Duplicate Files Scanning Result Cannot be Saved? 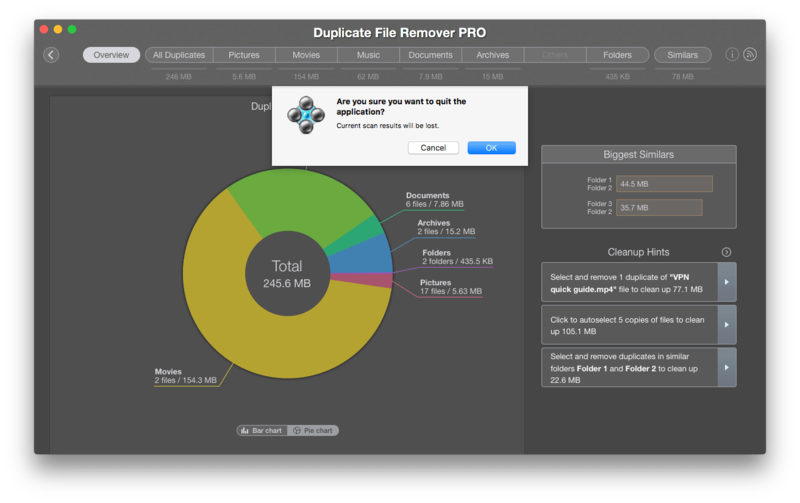 Duplicate File Remover Pro is a powerful application for searching for duplicate files and folders on Mac. It has helped thousands of users to get rid of useless “space eaters” on disks. All you need to delete duplicates is to scan your folders, view the results and select the files for removal. Please note, if you close the application, the scan results can’t be saved. The users often ask us about its reason, so we decided to explain. Why Duplicates scanning result can not be saved? Duplicate File Remover Pro does not have the ability to “save” scanned results because of security reasons. If saving and then loading duplicates hierarchy, you might get incorrect results. There can be duplicate files that might be removed already. So, you can remove the only left original file. Let us explain. Imagine you have 3 duplicate files: A, B, and C. You scanned your Mac, found these duplicates and saved the state. Then you or any other user/app remove files A and B. After you loaded your results, still there are 3 duplicates exist and you might decide to remove duplicate file C. By removing it you will lose all your files (A & B had been removed by another app already). So, saving and loading scan results might be really confusing, and conduct you to make the wrong decision.